Private foundations, given their charitable orientation, are often overlooked in the competitive arena of investing. However, these firms control vast fortunes that are strategically deployed to enact social influence over a long duration -- often in perpetuity. Private foundations in the U.S. control $798.2 billion of assets (as of 2013), according to the National Center for Charitable Statistics’ latest data. Understanding the strategies and challenges of achieving fiscal security to further their mission is key to this subset of institutional investors. In the United States, private foundations are required by the Internal Revenue Code section 501(c)(3) to pay out a minimum of 5 percent of their investment assets in order to avoid paying taxes. This mandatory payout rate defines the target rate of returns for foundation investors and directly drives their investment strategies. The size of private foundations vary greatly. The National Center for Charitable Statistics estimates that only less than 10 percent of private foundations manage more than $10 million. In part one of Top 20 Private Foundations In America, Trusted Insight profiles 10 prominent multi-billion-dollar charitable organizations established by the founders of America’s largest and oldest companies of the modern age, such as Microsoft, Intel, Hewlett and Packard and Ford Motor Company. Here’s what they do and how they manage their money. The Bill & Melinda Gates Foundation is the largest private foundation by assets under management in the United States. The foundation works with partner organizations in over 100 countries to address issues in four particular areas: poverty alleviation; health science and technology; education improvement; and global policy and advocacy. In 2006, Warren Buffett made a hefty donation of $30 billion to the foundation. Since then, the foundation has been able to save the lives of 122 million children, 86 percent of whom now receive basic vaccines, the New York Post reported. The foundation's most recent philanthropic activities include a $279 million investment in the Institute for Health Metrics and Evaluation to expand its global impact for the next decade. An October 2016 press release indicates the foundation will proceed with a $1 billion investment in British research and innovation programs. Michael Larson was named chief investment officer of the foundation in 1993. Larson takes a diversified portfolio management approach by investing in alternative assets across geographies. The Foundation’s Trust, which manages its assets, is heavily invested in public equities, which accounts for 63 percent of the total portfolio, according to its 2015 financial statement. The trust also holds a sizeable debt allocation comprising more than 32 percent of the total portfolio -- much of that residing in U.S. government bonds. The Lilly Endowment Inc. was founded in 1937 by Josiah K. Lilly Sr. The Indianapolis-based foundation was funded by the Lilly family’s pharmaceutical business, Eli Lilly and Company. Today, the foundation operates as a separate entity from the family company. The Lilly Endowment supports causes of religion, education and community development with a focus on the state of Indiana. Its most recent activities include a $9 million investment in school counseling programs that benefit more than 200 schools in Indiana. Diane M. Stenson serves as the vice president and treasurer. The foundation launched a diversification plan in 2006. The endowment holds small cash and fixed income allocations, which account for roughly 0.5 percent of the total portfolio. The remaining 99.5 percent is listed as marketable securities, but is not broken down into more descriptive asset classes, according to their 2015 annual report. The Ford Foundation was established in 1936 by Edsel Ford, son of Henry Ford, when he was the president of the Ford Motor Company. The foundation received its first donation of $430,000 from Edsel Ford’s personal wealth. Its mission includes promoting social justice, poverty alleviation and advancing human achievement globally, according to the foundation website. It has funded projects in China, Brazil, Colombia and Zimbabwe, as well as provide aid to domestic issues like the water crisis in Flint, Michigan. The foundation's most recent project was an annual commitment of $200 million to build ecosystems of institutions and networks that promote change. It is also an early investor in venture capital firm Sequoia Capital, The Wall Street Journal reported in 2004. Eric Doppstadt is the current chief investment officer, and has been with the foundation for 27 years. The Ford Foundation is heavily invested in global equities, at more than 54 percent of the portfolio, according to its 2015 financial statement. Venture Capital is the second most prevalent asset class, at 14 percent of the $11.5 billion portfolio. The Robert Wood Johnson Foundation was founded in 1972 by Robert Wood Johnson II, one of the sons of Johnson & Johnson’s co-founder Robert Wood Johnson I. It is the nation’s largest philanthropy dedicated to health care. The foundation runs the Culture of Health, a collaboration of institutions and leaders dedicated to improving health and well-being. A recent charitable act includes a $3 million investment in 50 mid-size U.S. cities to improve health in low-income neighborhoods. Brian S. O’Neil has been the chief investment officer since 2003. The foundation’s largest allocations are to private equity and commingled, multi-strategy hedge funds, which each count for roughly a quarter of total assets. The William and Flora Hewlett Foundation was founded in 1966 by William Hewlett, who co-founded the Hewlett-Packard Company with David Packard, and his wife Flora Hewlett. Their philanthropic vision is portrayed through various programs that support education; the environment; global development and population; performing arts; and helping disadvantaged communities in the San Francisco Bay Area. The foundation currently has 1,400 active grants. In 2015 alone, they awarded a total of $400 million in grants. In 2014, the foundation committed to a three-year $50 million investment in the Madison Initiative, a joint effort with former and current government leaders, nonprofit advocates and researchers to address major political issues facing the country. Ana Marshall has been the chief investment officer since 2004. She is an advocate for the diversification of endowment fund and social investment policy. Marshall believes in having a long-term view - finding the highest quality managers in order to have a concentrated portfolio. The foundation’s portfolio has roughly 54 percent of its assets invested in alternatives and another 26 percent in commingled funds, according to its 2015 financial statement. Trusted Insight interviewed Marshall in March. Read the interview here. W.K. Kellogg Foundation was founded in 1930 by Will Keith Kellogg, the founder of Kellogg Company, a breakfast cereal pioneer. The private foundation receives most of its resources from the W.K. Kellogg Foundation Trust. But the foundation and the trust operate as two separate entities. The foundation’s core mission is supporting children, families and communities. Joel Wittenberg is the current chief investment officer, and has been with the foundation since 2009. Prior to managing the foundation’s assets, he was the treasurer of the Kellogg Company. The foundation invests 59 percent of its assets in Kellogg company stock, with roughly equal single-digit allocations to public equities, commingled funds, hedge funds and private equity, according to its August 31, 2016 financial statement. Trusted insight interviewed Joel Wittenberg in November 2015. Read the interview here. 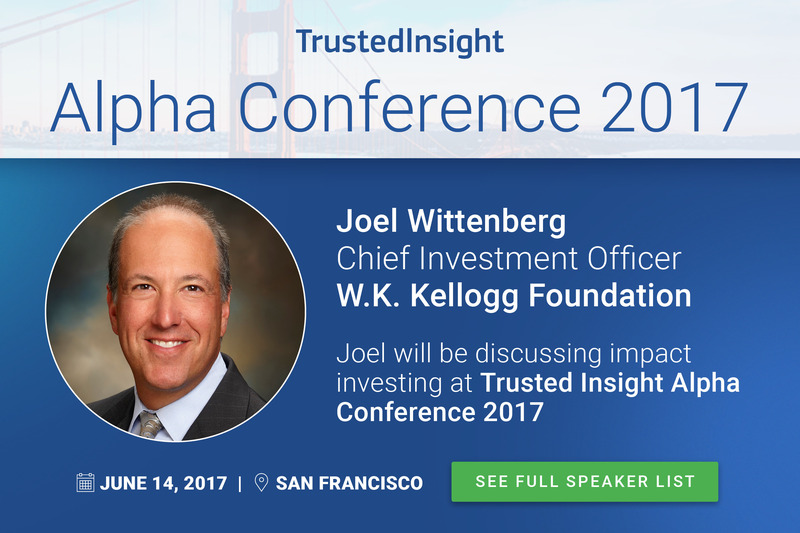 Hear insights from Wittenberg at Trusted Insight Alpha Conference on June 14. Bloomberg Philanthropies was founded by businessman and former New York City mayor Michael Bloomberg in 2006. The foundation is most passionate about addressing issues associated with public health; the environment; education; government innovation; and arts and culture. In 2015, Bloomberg Philanthropies announced a $30 million investment plan to strengthen 300 art and cultural organizations within six cities: Boston, Chicago, Dallas, Detroit, Los Angeles and San Francisco. Brad Briner and Andrew Mulderry are co-chief investment officers of Willett Advisors, Michael Bloomberg’s private family office that manages the foundation’s investible assets. Willett manages more than $7 billion in foundation assets with financial interests in Brazil and China, according to the foundation’s 2015 tax filings. The David and Lucile Packard Foundation was founded in 1964 by David Packard, the co-founder of Hewlett-Packard, and his wife Lucile Packard. This foundation funds conservation, science, population and reproductive health, children, families, and communities and local grantmaking. Its most recent charitable cause was a $20 million funding in a climate mitigation program in 2015. John Moehling joined the foundation in 2007 as its first chief investment officer. The foundation has a third of its portfolio allocated to marketable alternatives, with developed market equities accounting for another 21 percent of total assets, according to its 2015 financial statement. The J. Paul Getty Trust was founded in 1984 by J. Paul Getty, founder of the Getty Oil Company and famed art collector. The foundation’s mission is to make art available for public education and enjoyment through its four divisions: The Getty Conservation Institute, The Getty Foundation, The J. Paul Getty Museum and The Getty Research Institute. James M. Williams has been the vice president and chief investment officer since 2002. Williams is in charge of a $6.6 billion endowment, which underwrites the foundation’s art museum, acquisitions, grants and art conservation activities. That capital is allocated roughly equally across commingled equity funds (24 percent), real assets (15 percent), hedge funds (20 percent) and alternative assets (nearly 16 percent), with smaller allocations to debt, common stock and cash equivalents. Gordon E. & Betty I. Moore Foundation was founded in 2000 by Gordon Moore, the co-founder of Intel, and his wife Betty Moore. The foundation aims to address issues associated with environmental conservation, health care and the preservation of the San Francisco Bay Area character. Recent charitable activities include a $100 million investment to Andes Amazon Initiative, a program to help secure the biodiversity and climate function of the Amazon basin. Denise Strack has been the chief investment officer at the foundation since 2008. Previously, she managed the foundation’s private equity and real assets investments. The foundation allocates roughly a third of its portfolio to public equities and another third to hedge funds, with fixed income, excess returns, real assets and cash comprising the remainder of the portfolio, according to its 2015 financial statement.